The width of a doorway inside a building that you frequently visit, is a measurement that is hardly ever brought up or talked about. To meet the ADA accessibility standard, doors must have a clear width of 32 inches from the face of the door to the opposite stop. People in wheelchairs have to think about this at least once a day, because they are the ones who actually need to have enough clearance for a wheelchair to fit through a doorway. This is why this piece was written, to bring awareness to the fact that every single building in America should have the necessary doorway width on all doors on any building. To be able to correctly resize a doorway to an exact measurement, you will to relocate a lot of different things. This would include relocating the light switches next to doors, wiring located inside the wall will have to be moved, and electric sockets also would need to be moved if they are in the way. 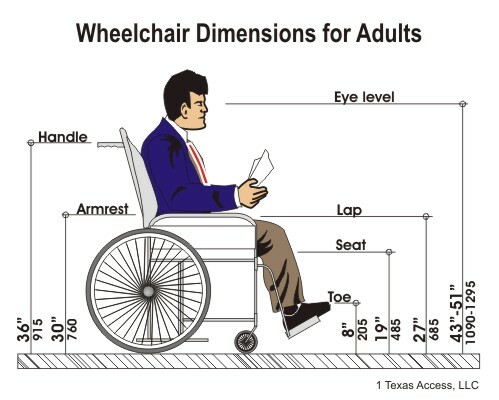 The correct size for a wheelchair user to be able to comfortably fit through a doorway is 32 inches wide. Commonly, doorways are measured at about 23 to 27 inches; this would not be wide enough for a user to fit through. When there is a sharp or narrow turn you have to make in order to fit through the door, there needs to be more clearance in order for the user to make it out of the narrow hallway or room. The width of a building’s doorway may cause the owner to have to spend money to remodel the doorways if they are not wide enough for wheelchairs. Finding a contractor to do it and paying out of pocket can be expensive for small-mid size businesses. The government provides the Specialty Adapted Housing Grant, which can help finance the expenditure of door width remodeling. If the doors are too narrow in your house, they can be widened through remodeling of walls and entryways. You may need to remove the door unit and doorway trim in order to be able to properly resize the doorway. The amount of space necessary for a narrow or slim wheelchair to get through a doorway is a lot smaller than it would be for a regular chair. 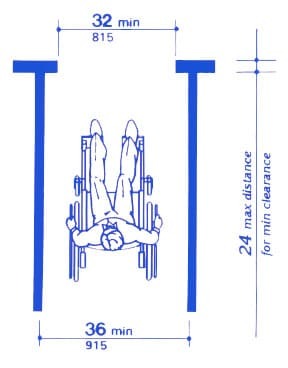 This is because the chair is designed specifically to be very narrow in width to provide the user with the most universal width possible for this type of chair. This enables the user to get through doorways that do not meet ADA specifications; this sort of thing is most common outside of the US. If you are in a situation where the places you frequent the most are not complying with the ADA (most likely rural and places outside the US) you will need to look into purchasing a wheelchair designed for narrow doorways/hallways. The easiest way to start this search is to look for transport wheelchairs. Transport wheelchairs are some of the most narrow chairs available today, with some of them reaching the low 20” overall width. The most slim chairs in this category are the pediatric versions of each model, as their seat size can be as low as 14” overall, which would make it so that you could technically pass through a door with a width of 24”(not recommended).